Unleash the 50,000 watt flamethrower of content creation in your UNIX box. Cinelerra does primarily compositing and editing of audio and video in 1 seamless environment. It's a movie studio in a box. Cinelerra is not community approved and there is no support from the developer. Donations to community websites do not fund Cinelerra development. Ever since the first time we saw Wavelab producing real time reverb and EQ in 1997, real time processing has been the cornerstone of Cinelerra development. Today, most every operation can be done in realtime, including processing of the time domain, out of order. Also, track bouncing, side chaining, and reuse of effects between multiple tracks has always been supported. Cinelerra supports OpenGL shaders on NVidia graphics cards. As long as the driver version happens to work, the video crunching power that was once exclusively the domain of SGI minicomputers is now yours. NVidia users can run many effects in realtime instead of rendering them. OpenGL also opens up new video resolutions, up to 4096x4096 on high end cards. Cinelerra does not support every codec ever invented, but it does support the most common WMV and FLV derivatives well enough to transcode them into a format suitable for editing. Most formats can be edited straight off the DVD, Blu-ray, or original file, without transcoding. The format that all your favorite online video networks import, H.264 video + MPEG4 audio on Quicktime, is the standard export format. For most operations on a modern computer, you can get comfortable speed without a renderfarm. But just so you know, it's there. Renderfarm is supported for rendering and background rendering, creating a theoretically unlimited maximum speed. The biggest difference between this renderfarm and normal renderfarms is you don't need to pay for node licenses. You can keep installing nodes without paying for either the operating system or the application. Store and retrieve images in the best possible fidelity with floating point imaging and file formats. Access OpenEXR, the official file format of Lucasfilm. Access CR2 images from Canon EOS digital cameras in floating point. Adjust color levels without losing information. Never have to guess how far out of range the colors are. 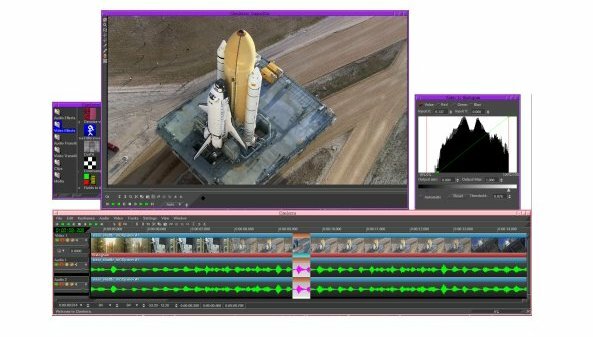 Save high dynamic range intermediates for multiple steps without losing data. Since it's Linux, it's been 64 bit compliant for years. In fact, Cinelerra is only tested in 64 bit mode. The reason is the large amount of virtual memory required for page flipping and floating point images often exceeds the limit of 32 bits.